Assassination illustratit in the Italian newspaper Domenica del Corriere, 12 Julie 1914 bi Achille Beltrame. 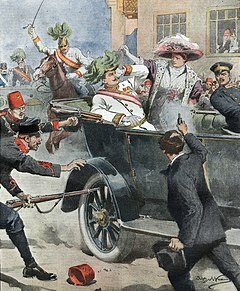 On 28 Juin 1914, Airchduke Franz Ferdinand o Austrick, heir presumptive tae the Austro-Hungarian throne, an his wife, Sophie, Duchess o Hohenberg, war shot dead in Sarajevo bi Gavrilo Princip, ane o a group o six assassins (five Serbs an ane Bosniak) coordinatit bi Danilo Ilić, a Bosnie Serb an a member o the Black Haund secret society. The poleetical objective o the assassination wis tae break off Austrick-Hungary's Sooth Slav provinces so thay could be combined intae a Yugoslavie. The assassins' motives war consistent wi the movement that later acame kent as Young Bosnie. The assassination led directly to the First Warld War when Austrick-Hungary subsequently issued an ultimatum tae the Kinrick o Serbie, which wis pairtially rejected. Austrick-Hungary then declared war. This page wis last eeditit on 7 Julie 2015, at 15:02.